If you’ve found me here please come over to http://www.annettebower.com after March 27, 2012. I went live on the new web page. Tina Brunelle posted a blurb about Moving On A Prairie Romance and my short bio on her blog. And of course places to buy my book. So go and have a look as well as check out some of the other books she features. The Society magazine published by St. Peter’s College in Muenster, SK accepted “Help” a one hundred word story for publication in their 2012 edition. I would love to be at the magazine’s launch on April 2, 2012, but I will be reading from Moving On A Prairie Romance at the Vertigo Reading Series in Regina on that evening. It feels so great when an editor accepts my work to be part of a whole magazine. The magazine will be revealed late on April 2nd. When it goes up, it’ll be at http://www.stpeterscollege.ca. One of the books you could win in my book, Moving On A Prairie Romance. 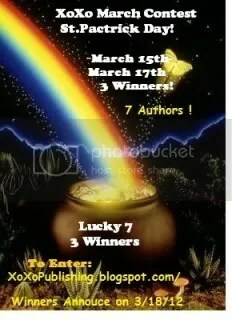 It is easy to enter, go to the blog site: http://xoxopublishing.blogspot.ca/ and follow the steps, you can enter everyday, however there it is over at midnight on St. Patrick’s Day, so go there now and enter and then enter again. Today XoXo Publishing™ media person, Ana Torres put Moving On A Prairie Romance on Goodreads. Here is the link http://www.goodreads.com/book/show/13530524-moving-on-a-prairie-romance-kindle-edition. Every time a book is placed in a new location it provides another opportunity for a reader to find it. I’m pleased that my book is now available on this site. Please check out our contest and win some great books. Debra Jayne asked me some questions about myself and about my book, Moving On A Prairie Romance. When another author poses a thoughtful question it gives this author a pause for thought and clarity into her work. I hope you go to Debra Jayne’s blog and read the interview as well as have a look at her book, Radience: Love After Death. A friend who lived on the same road as I did many years ago and our children rode their bikes, skateboards, had pretend bands in our garage, read my book. She emailed me and gave me permission to post her remarks. “I just finished reading your book. WOW that was great. Of course, my friend, I knew you are the best writer ever. The story was great – loved the characters – they felt so real. I was disappointed though that it came to an end. I think you can make a saga!!! Are some of the characters people you based on from Regina Beach? How long did it take you to write the book. Have you started another one?? Well keep writing Annette – you are truly gifted. Yes, she is a friend and we spent many hours walking the urban streets and drinking coffee so very many years ago. We shared so much but what is truly humbling is that she believed. I have had this support in my life and sometimes it is just too easy to remember when the publishers are sending the manuscript back because it doesn’t fit their story line or it wasn’t quite ready. Thank you Marilyn and all my other supporters who have cheered me on. When you’re checking out new writers please go to Kevin’s blog and read the other interviews. And here is an introduction to Kevin copied from him web page. “Kevin Middleton was born September 28, 1964, in the town of Lindsay, Ontario. An ardent bookworm since childhood, he loves to immerse himself in numinous worlds populated with quests and flights of the imagination. Authors such as J.R.R. Tolkien and David Eddings have long moved him, and it has always been his vision to put pen to paper and give back a little of what he has so long enjoyed. was perfect. I highly recommend the vacation to all of you. Saskatchewan” with me to read. them. (I enjoyed the whole book). combination of our family members, also of folks I know from work. When I write a story I want to connect with a reader and have them connect with my characters. It is a wonder to me when it happens and even more wonderful when a friend takes the time to share with me. Thank you K.